You will agree with me that; with summer in mind, it is important to own at least a Portable Air Conditional for comfort. So! Don't let allow the heat to get you down! Portable Air Conditional are very important during summer days (or summer period). The summer days means the time of heat and that is not something you should pay less attention to, you should plan your self early before the summer period so that you would be comfortable during the heat period. 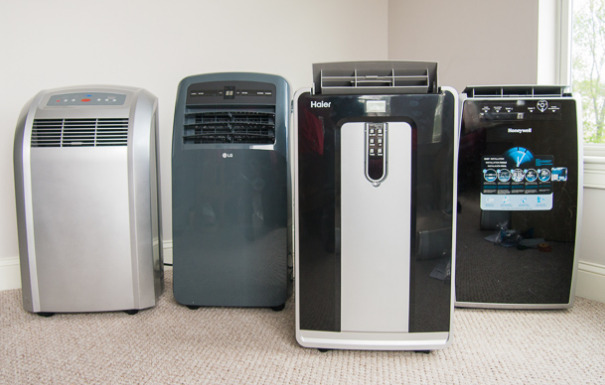 Planning ahead of the summer period is where Portable Air Conditioner (AC) comes in to play an more especially because some of the are cheap and can be taken from one place to another within the room providing real cooling. 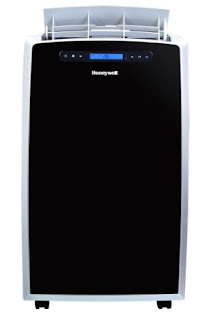 To some persons, the Honeywell CS10XE Portable Air Conditional is the best for budget buyers, while to some (without the price in mind), the LG LP1215GXR and Honeywell MN12CES portable air conditioner is the best. For those that don't know which one to buy, that is where this list of the 10 Best Portable Air Conditioner (AC) 2017 comes in to play. Surely, some of the Portable Air Conditioner listed here are not for everyone as them carry a hefty price-tag. With that in mind, one thing can be for sure, that these Air Conditioners are very much good enough to make it to our list of the top 10 best Portable Air Conditioners 2017. Someone may ask, why is the Honeywell HL14CHESWW HL Series and Haier HPN14XCM Air Conditioners are not among my list? To be honest, these Portable AC's are extremely expensive and there are no much difference in value to what the cheap once can offer, even some has the same British Thermal Unit (BTU). So for these reason, I did not not include them. NOTE: Because these Portable Air Conditioners are not among the list does not mean that they are not good, in fact they are awesome. Just that, they are too expensive. 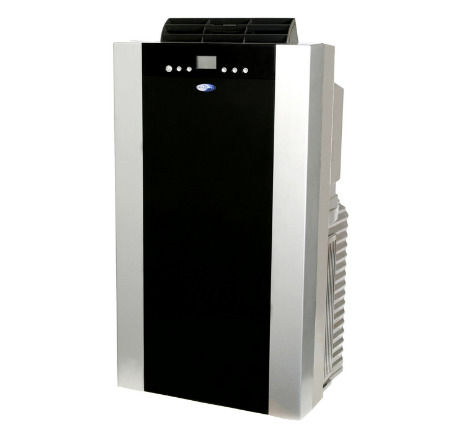 The Whynter ARC-14S is designed to offer an impressive cooling capacity with its 14,000 BTU. With this BTU, this portable AC is capable of cooling a large room in a short period. It offers three modes; cooling, dehumidifying, and fan. The Cooling mode cools and dehumidifies the room. It can also dehumidify without cooling by only choosing the dehumidifying option, while the Fan mode circulates air in the room and offers four fan speeds to choose from. It supports a dehumidifying capacity of 101 pints per day and an adjustable digital thermostat that ranges from 61 degrees F to 89 degrees F.
This unit can be used for classroom, living room, office, and more. The AC consumes minimal power supply and the use of CFC-free refrigerant, R-410A, makes it an environmentally friendly system that does not interfere with our surroundings. The AC comes with a highly effective auto drain mechanism which helps to prevents accumulation of the condensate, and the ARC-14S dual-hose air conditioner comes with an easy-to-install venting kit. Just as air conditioners has a built-in mechanism for cleaning and freshening air. The Whynter ARC-14S, has a pre-filter that is used for air filtration, it also has an odor-neutralizing carbon filter for air freshening. The pre-filter can be cleaned by simply removing it from the unit and rinse, tap off, or vacuum the accumulated dust. It is advisable to replace the carbon filter in every two to three months. At the control panel is an LCD display and simple selections button, including a mode selection button, up/down for the temperature adjustments, and fan speed selection. The unit can be programmed to activate or shut off at preset times with the 24-hour timer. It also comes with remote control that puts the full set of functions in your hands. 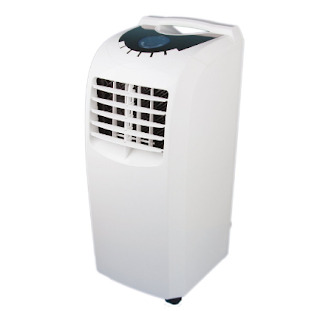 Nevertheless, it is slightly disappointing that this Whynter Portable Air Conditioner is very noisy, but the unit does a good job in as large as a 600 sq feet living room/kitchen/hallway and we were impressed by the three-in-one design of this portable system. With a single unit, you can cool, dehumidify, and fan your room. 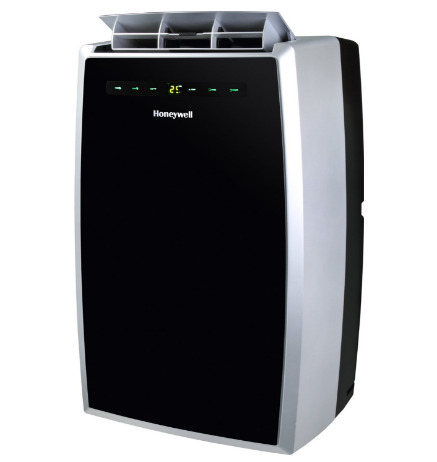 The Honeywell MN10CESWW is an impressive 10,000 BTU portable air conditioner with a sleek, modern design cooling and dehumidifying. The unite built with 3-in-1 technology, 3M electrostatic filter and an environmental friendly compressor. This portable unit is built to delivers optimum cooling and dehumidification for an areas up to 350 square feet. It also has a fan-only function and comes with a full-function remote control that allows you to operate each feature from across the room. The unit does not require a permanent installation, it has four caster wheels that provides easy mobility between areas. It has an auto-evaporation system that allows hours of continuous operation with no water to drain. This model comes with everything needed including a flexible exhaust hose and an easy-to-install window venting kit. The window vent can be removed when the unit is not in use. The biggest attraction of this unit is its no-bucket, auto-evaporation design, which accounts for the unit’s prolonged, non-stop performance. The slim and suave modern aesthetics are complemented by a dehumidifier that expels 68 pts. of moisture from the air per day which is quite interesting. The 3 in 1 technology ensures healthy and purified chilled air, the 3M electrostatic filter can be effortlessly accessed from the back for easy washing and maintenance. It can be quick and easy to install, it has a high, low and medium multiple fan speeds and 174 CFM powerful air flow, includes a washable filter that helps catch unwanted dust particles in the air with a programmable timer that can be set to turn ON/OFF in advance from 1 to 24 hours. Its annoying that you may need to buy an additional hose for this Portable Air Conditioner, because the one that comes with it is short. But, the unit is a nice one that can easily fits in the window slide of classrooms, office cabins, garages and bedrooms. Without the hassle of installation, you can enjoy the power of LG Portable Air Conditioner, thanks to this efficient and portable AC that is capable of cooling up to 300 sq. ft. of space. This unit comes with easy-to-roll casters, to make it easy to trasport the unit to where you need it most. It has an Auto restart which automatically resumes the previous program after a power interruption so that as soon as there's power it begins cooling. 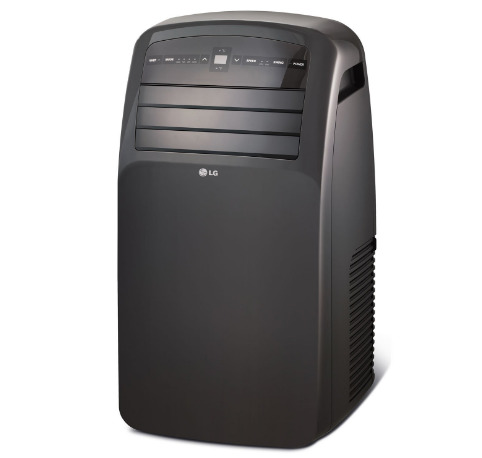 The LG LP1215GXR is a 12,000 BTU and 115V portable air conditioner with LCD remote control , it is the ideal climate-control solution for when you're on the go - from room to room, house to house or home to work and its quick and easy to install. The unit features an innovative dehumidification function that mixes cool dry air with the warm air to keep the place comfortable and prevent over-cooling. The oscillating air vent technology circulates the dispersed air more efficiently. And, with the programmable 24-hour on/off timer, you can control the temperature even when you're not there. It uses Energy Saver Mode that cools the home effectively with less power, which makes it an economical device. One thing that many persons are really concerned about when thinking about buying one of these units was water drainage and these LG LP1215GXR has its drainage at the top high, roughly in the middle of the unit on the back side and its very easy access. If you select "Fan" the compressor the AC turns off and it simply blows air (as expected). If you switch back to "Cool" it continues to only blow air (no compressor). Even cycling it on/off will not fix it, you need to unplug it and plug it back in. This Portable Air Conditioner works very well but is a bit iffy in some areas. But, it is a nice Air Conditioner. The unit itself is pricey in the long-term due to the power usage, the cost is a bit high, but when you factor in the extra monthly costs, it only goes up. You can either deal with the heat and try to use fans all summer or pay the price and get a comfortable level of cool air out of it. 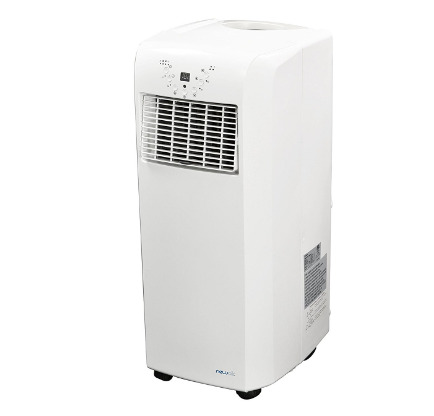 The Global Air NPA1-10C is a 10,000 BTU Portable Air Conditioner capacity that keeps a room or hall of up to 300 sq. ft, cool and comfortable with dehumidification up to 2.6 pints per hour. You can enjoy portable cooling with the unit, that uses a 2-speed cooling and fan and 4-way air direction that help spread the air evenly throughout the room. The unit makes use of a washable and reusable air filter that saves you money on replacements; IT is advisable that the Unit stays upright for 24 hours before use and must be vented to the outside by following the included window installation kit and follow detailed installation instructions in the Owner's Manual. The 10000 BTU of Global Air really does a decent job to cool and maintain comfortable temperature. Within a couple of hours, the unit bring down a temperature from 87 to 80. If the unit is kept through an entire day and turn on fan only it can maintain 76 degree temperature. Surprisingly the unit has high end even though and it is the cheapest of with 10000 BTU capacity. It has touch sensitive buttons and nice sleek panel. Also the vent door is automatically opens/closes. Size wise it's only slightly taller then my 12000 BTU, but a bit thinner. 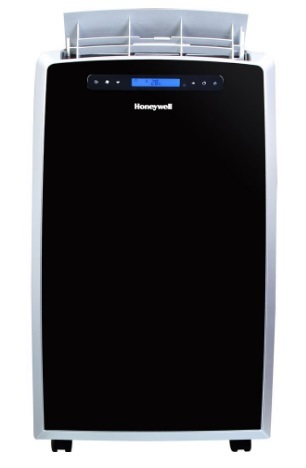 The Honeywell MN12CES is a cute an portable AC with 12,000 BTU capability, it has a sleek, modern design cooling and dehumidifying areas of up to 450 square feet. The unit uses a 3-in-1 technology, 3M electrostatic filter and a compressor to deliver an optimum cooling and dehumidification. It also has a fan-only function and a full-function remote control. The full-function remote control allows you to operate each feature from across the room. this unit does not require a permanent installation unlike a fixed AC and its four caster wheels provide easy mobility between areas. Also, it has an auto-evaporation system that allows hours of continuous operation without dripping water. This model comes with a flexible exhaust hose and an easy-to-install window venting kit. The window vent can be removed when the unit is not in use. It employs a washable 3M electrostatic filter. The unit can be used as an air conditioner, fan, or dehumidifier giving you the choice of three speeds for the fan: high, medium, and low. When using the air conditioner you can set the temperature from 61° to 89°. The unit comes with a timer so you can set the unit to come on when you want it to. You can also set how many hours you want the unit to run. Effective cooling, especially for rooms below 500 sq ft. 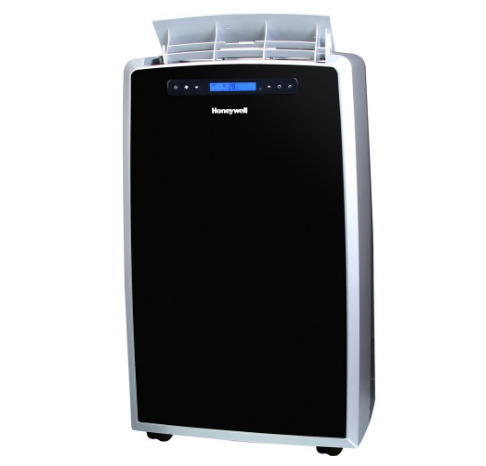 The unit offers 3-in-1 functionalities; cooling, dehumidification, and fanning. Not really a con, but th unit is very loud. The Honeywell MN12CES air conditioner is a powerful unit that offers fast cooling within a short time that is based on it's three-in-one design and offers three functionalities with a cooling capacity of 12,000 BTU, the system is suitable for a 400 square feet space. The Haier HPB10XCR is a good portable Heat/Cooler portable AC with a capability of 10000 BTU, it is ideal for spot cooling of rooms up to 350 sq. ft. 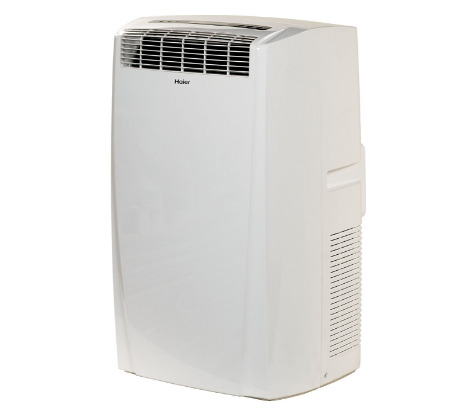 This Haier 10,000 BTU air conditioner can be used in single spaces within a large house, as well as in smaller standalone areas. The unit can provide both cooling in the summer and supplemental warmth in colder months. It features three cool settings, three fan settings and three heat settings. It has a convenient 24-hour on/off timer that can help to boost efficiency and at the same time reduce the rate of power consumption. This heat/cool air conditioner also has a dehumidify mode to help reduce moisture in the air. It comes with a quick-install window kit. The dehumidify feature is separate from the cooling feature however, the cooling cycle is supposed to evaporate the humidity it condenses while in the cooling mode so you will not have to drain the unit. Additionally, the feature I like most about the unit is while in the cooling mode the fan runs continuously to keep the air circulating in the room thus eliminating any cold or hot spots in the room. Again, all in all this is a good unit. Its easy to install and cools the room good and takes about 10 min for the compressor to come on when you start it up from being off for a while. Its a good product just bear in mind that most potable ac units are noisy. 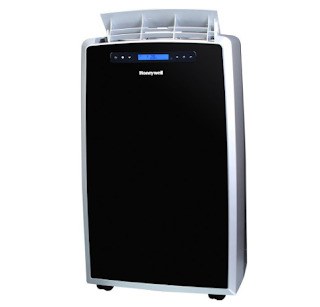 The Honeywell MM14CHCS 14,000 BTU Portable Air Conditioner with 12,000 BTU Heat Pump is a 4-in-1 unit combining an air conditioner, dehumidifier, fan and heater all into one portable unit. In addition, it has a full-function remote control allows you to operate it from across the room. Unlike a fixed AC with heat pump, this unit requires no permanent installation and has four caster wheels that provide easy mobility between areas. It also has an auto-evaporation system that allows for hours of continuous operation with no water to drain or a bucket to empty. This model comes with everything needed including a flexible exhaust hose and an easy-to-install window venting kit. The window vent can be removed when the unit is not in use. It is an ideal climate-control solution when you're on the go. It has a sleek contemporary design, this free standing unit blends in with any room decor. Further more, the portable air conditioner has a Digital LCD display with feather touch controls and with the programmable 24-hour Heat Pump Automatic shutoff timer that allows you can control the temperature. Apart from the fact that this Air Conditioner expensive, it is what you need to cover a large area. The system performs very well in an area size of up to 550 sq. ft. with dehumidifies up to 79.2 pints per day. You can expect it to give you the cooling that you desire. It has wheels that allows it to move from one place to another. Considering the fact that its 14,000 BTU portable air conditioner with 13,000 BTU built-in heat pump, the price is a slightly expensive compared to others within the same 14,000 BTU. But, in all, it is a very good AC that is good for a large area space. 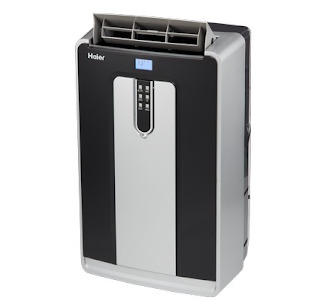 This Haier 12,000-BTU portable air conditioner is ideal for spot cooling mid-sized rooms that is up to 450 square feet. It has a three cool settings, three fan settings, a 24-hour on/off timer and dehumidify mode. This unit is a single-hose model that is equipped to meet an interior climate needs, it has a quick-installation Window Kit that is included for exhausting the unit through any horizontal or vertical opening window and fully directional casters provide mobility. It is a low cost unit that requires a minimal maintenance with a slide-out washable mesh filter with an auto evaporation technology that automatically evaporates water, making manual draining unnecessary. The NewAir AC-10100E is an ultra compact portable air conditioner with 10,000 BTU cooling power. The unit is capable of cooling rooms up to 325 square feet. It's also easy to install and offers a fully portable and can be moved comfortably to wherever you need cooling comfort. It offers an improved Air Quality with a washable carbon filter. It features a built-in dehumidifier, which removes moisture from the air for added comfort, an easy-to-use remote control and has an LCD display with a push-button control that makes it easy to cool your space to the perfect temperature. The unit also comes with a 12-hour timer, sleep mode and the auto-fan function that automatically maintains your set temperature by raising and lowering the fan speed. This is ideal for bedrooms, home offices, dorm rooms and other personal spaces. The portable AC uses self-evaporative technology that improves cooling efficiency by using water from the air to cool the compressor coils. It also reduces the amount of condensate water collected in the tank, so you won't have to empty or drain water regularly. The unit is a good cooler with an ultra compact design, ventilates and dehumidifies spaces up to 325 square feet that uses energy-efficient technology reduces energy consumption with an auto-evaporative system offers hours of continuous operation without draining. 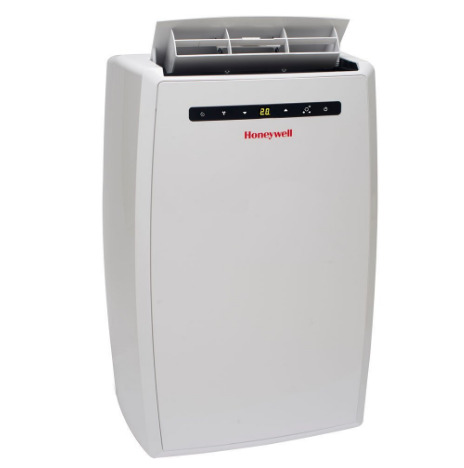 The Honeywell MM14CCS is a 14,000 BTU Portable Air Conditioner that has a sleek, modern design and dehumidifying areas up to 550 square feet. It uses a 3-in-1 technology, 3M electrostatic filter and a compressor. This portable air conditioner delivers optimum cooling and dehumidification. It also has a fan-only function, full-function remote control that allows you to operate each feature from across the room. This Honeywell MM14CCS does not requires a permanent installation like a fixed AC and it has four caster wheels that provide easy mobility between areas where the cooling is important. Also, it has is an auto-evaporation system that allows no water to drain or bucket to empty for several hours of continuous usage. This model comes with a flexible exhaust hose and an easy-to-install window venting kit and when not in use, the window vent can be removed. The unit features Cooling, Fan and Dehumidification options, the dehumidification offers up to 79.2 pints per day, has a digital LED display, precise feather-touch controls and full-function remote control 3 speeds and automatic on/off timer from 1-24 hours. Everyone's view is different. So before you buy, just make sure you take time to see if the one you need meets the key features. Considering how the market of Portable Air Conditioners is pretty saturated, finding the perfect Portable Air Conditioner is never an easy task. That’s when lists like these seriously comes into play. The list was crafted with carefulness and keeping in mind things like what the customer would need (like the features above) and how much are they willing to spend to get a Portable Air Conditioner. I hope the list helps you pick the Portable Air Conditioner according to your budget.